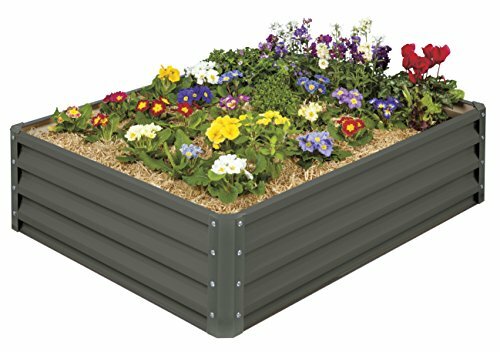 Metal Raised Garden Bed. 46" (L) x 35" (W) x 12" (H). Heavy Duty Metal Construction. Holds 11 cu ft of soil. Easy DIY assembly. No Tools Required. No Rusting. Not Rotting Like Wood. Not Chipping. No Cracking. High End Quality Metal Making Process at Factory Level - The steel has the color paint put in at the steel mill and is baked on through an extreme heating process. Beds do not chip or crack for this reason. Rust protection is added to the steel. Hard to show with pictures but you'll surly know the difference in person vs any competitive product. No Rusting. Not Rotting Like Wood. Not Chipping. No Cracking. High End Quality Metal Making Process at Factory Level - The steel has the color paint put in at the steel mill and is baked on through an extreme heating process. Beds do not chip or crack for this reason. Rust protection is added to the steel. Hard to show with pictures but you'll surly know the difference in person vs any competitive product.